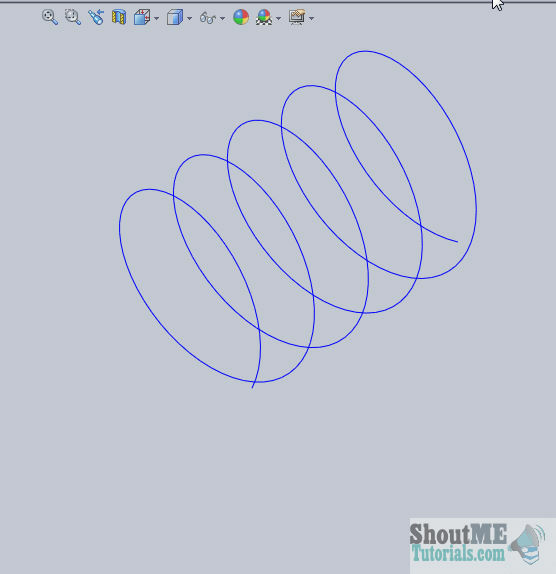 Welcome to SolidWorks tutorials for beginners and you are going to learn how to use helix feature command to make helix and spiral curves in SolidWorks. It is one of the most useful tool for professional CAD designers especially while making mechanical designs. If you are a mechanical engineering or CAD student, you should know how to use it in proper way. Here I will show you with an example for making helix in simple way. Why Helix and Spiral Feature Command? Helix and Spiral feature is used in SolidWorks for creating helical and spiral curves. You can make sketches of helical curves from a circle in different way by adjusting the pitch and revolution. You can also create constant pitch and variable pitch helical curves. In the same way you can have the Spiral curves too. Major application of Helix and Spiral feature command is that for making different types of springs (open/close type, taper etc), Internal and external thread cutting, making screws, bolts and nuts, screw pump rotors, screw type compressor rotors, spherical helix, square helix, spiral tubes, extended fin surfaces on tubes , spiral coils, heating coils, and more. Checkout Best SolidWorks Training Materials here. Let us learn helix and Spiral feature command in SolidWorks to gain better modeling techniques. 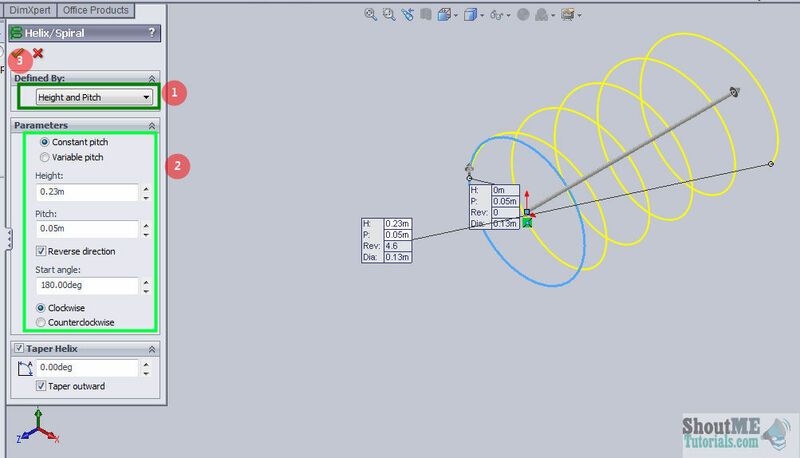 How to Use SolidWorks Helix and Spiral Feature? Here you are going to see the major capabilities of helix and spiral feature commands one by one. Before that, you should know how to access these feature tool in SolidWorks CAD software. 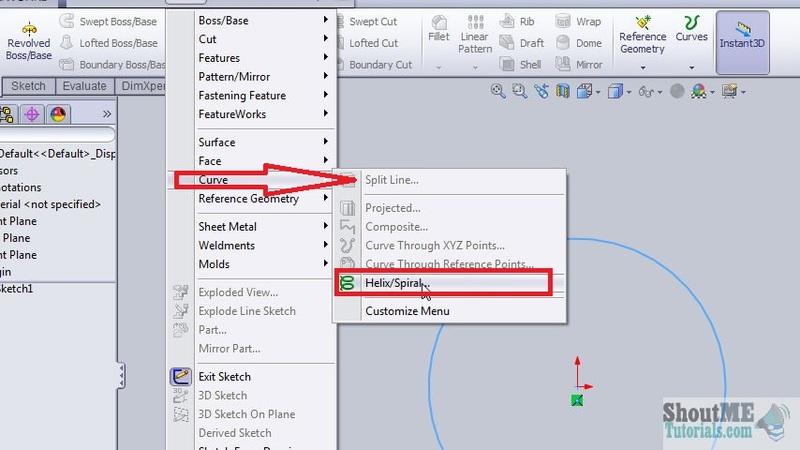 Like all previous SolidWorks tutorials, select default plane from the FeatureManager Design tree. Here I am going to select “Front plane”. Apply ‘NormalTo’ by using the mouse right button. For using the ‘Helix feature’, you need to draw circle sketch as the base sketch. Go to ‘features Command manager’ and click on the ‘Curves’. From the down menu, select ‘Helix and Spiral Feature Command’. Go to ‘Insert’ menu. From the scroll down menu, select ‘Curve‘ and click on “helix and Spiral” from the side down menu. Here I am splitting the tutorial into two parts. First you will see different methods of applying Helix feature and then see spiral feature application on the second part. When opening the “Helix and Spiral”, you can access the ‘Helix/Spiral property manager’. You can define the helix curves in three methods. They are Pitch and Revolution, Height and Revolution, Height and Pitch. Select ‘Pitch and Revolution’ in Defined by option in the property manager. In the parameters section of property manager, select ‘constant pitch’ option. You can also select the variable pitch if you have helix with different pitch to define. Currently you select ‘Constant pitch’ for learning purpose. Enter the pitch value (say, p = 0.0255 m), revolutions as ‘4’ and start angle as ‘0 degree’. Also choose helix direction as clockwise or counterclockwise. Click green tick button in property manager to finish with your helix curve. Select the ‘Height and Revolution’ in the define by section of property manager. Here you can set the height of the helix from the base circle. Also set the no of revolution and helix direction. Click green tick button to complete helix curve. Here you can set the height and pitch of the helix to define the helix. First select define by as ‘height and pitch’. Then set the parameters such as height, pitch and start angle which is shown below. To make spiral curve, you can use the same helix/spiral property manager. In that, select define by as ‘spiral’ and set pitch of your spiral curve. Also set the number of revolutions and start angle from your base circle. You should define the direction of spiral curve a clockwise or counter clockwise. Click on the green tick button to get spiral curve. To obtain taper helix curve follow the step 1 to step 3. From the helix/spiral property manager, you can see the ‘taper helix’ section. Define the ‘taper angle’ and also set the ‘inward or outward taper’. See the below image. If unpick the ‘taper outward’ option, you can see the ‘tapered inward’ helix curve. This is all about the helix and spiral feature command tutorial. You can see the step by step tutorial for application of helix/spiral curves. If you have any doubts about this tutor post, feel free to contact me through command box.